Add the Classic Brands Adjustable Comfort Adjustable Bed Base and transform your bedroom into the most used room in the house. Enjoy lifestyle benefits, including watching TV, reading, working on laptop and more. Plus, the benefit of knowing that you are breathing properly, decreasing potential snoring, lessening acid reflux and increasing blood circulation. Unwind with the relaxing head and foot massage. This adjustable bed base is a low-cost alternative to the more expensive ergonomic brands with the same features included. With the Adjustable Comfort Bed Base, a box spring is not needed - it acts as a platform bed, creating more room for under bed storage. 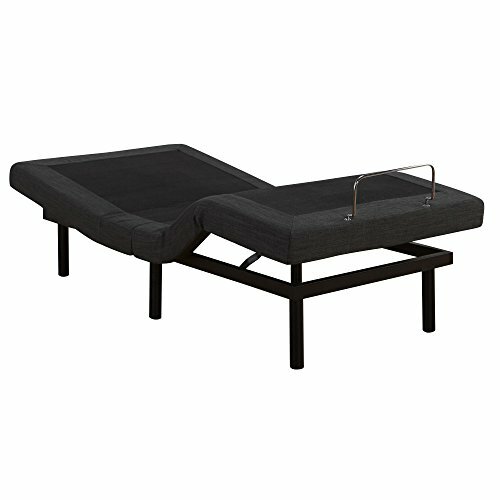 The Adjustable Comfort Bed Base is great for customers who need to be elevated due to a medical condition, as well as customers who just want the lifestyle benefits of having an adjustable bed. The head and legs can be raised and lowered using the wireless remote control, while the massage unit adds soothing comfort. Perfect for watching TV, reading, or working on your computer. The Adjustable Comfort Bed base ships small parcel and is easy to set up. Just unpack, assemble the frame and place your mattress on top. Works great with memory foam and latex mattresses as well as adjustable bed friendly spring mattresses. The Adjustable Comfort Bed Base has a sleek, contemporary look while providing the ultimate allover support for your mattress. The Zero Gravity Position simulates weightlessness and is similar to sleeping in a recliner. In this position, most of the stress in your lower back is eliminated, while increasing blood circulation, which reduces pressure points. Zero Gravity also takes pressure off the heart and allows for easier breathing. Adjustable beds are great for people who suffer from sleep apnea, heartburn, acid reflux or GERD. Sleeping upright can also help eliminate snoring and can temporarily relieve lower back pain and poor blood circulation of the legs. Relieve back or muscle strain by finding the perfect position to gently soothe your body. The adjustable base allows you to fall asleep quickly while enabling you to sleep longer. With more rest, you will wake up more refreshed, energized and alert. Our Adjustable Comfort Bed Base not only works great for medical needs but also has many lifestyle benefits. With a touch of a button, you can position yourself for ultimate comfort as you read, study, watch television, talk on the phone, use your laptop computer, or play video games. Also, our Adjustable Comfort Bed Base is easy to sync, so each side of your king bed can be raised and lowered at the same time. With the mattress retainer bar, the mattress is prevented from sliding when the bed is raised and lowered. With a touch of a button, raise your head and feet, activate the massage unit or simply move to a preset position. Remote control is wireless, so you can operate the base from anywhere in your bedroom. With two built-in USB ports, you can charge all your devices while in the comfort of your bed. Easy assembly, designed to be used with adjustable base friendly mattresses; ships directly to your door. It is also a good idea to check the size and the height of your mattress to make sure you are ordering the correct size. Keep in mind that you should combine the height of the adjustable bed base and the mattress to get a gauge of the how tall your bed will be. Rest assured with a three-year worry-free warranty.